Made with tomato, sugar and a pinch of Worcestershire sauce and horseradish, this steak sauce will go well with any of your meat dishes, enhancing them with its sweet and smoky taste. Sugar and cane molasses, water, tomato puree (17%), malt vinegar (from barley), worcestershire sauce [malt vinegar (from barley), spirit vinegar, molasses, sugar, salt, anchovies (fish), tamarind extract, onions, garlic, spice, flavourings], horseradish root (4%), soy sauce, (water, soyabean, salt, wheat flour, sugar, colour: caramel), thickener: modified maize starch, seasoning (salt, smoke flavouring, spice extracts, flavouring, onion extract). 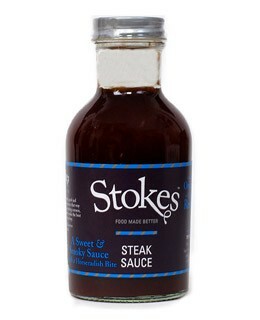 Based at Rendlesham Hall, near Woodbridge in Suffolk, Stokes only use the best ingredients and reduce, simmer, cook and make slowly in traditional ways. 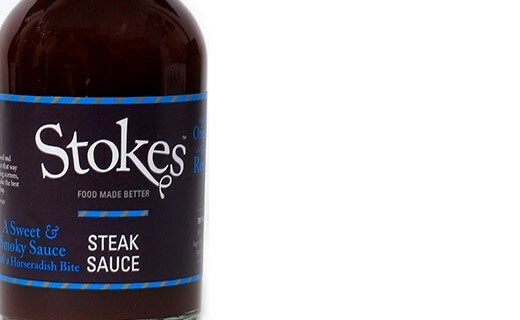 Contrairement aux autres produits présents sur edélices.com, les sauces Stokes ont la particularité de mentionner une DLUO (date limite d'utilisation optimale) assez courte. Nous vous garantissons toutefois que les sauces que vous recevrez de notre part n'auront jamais une DLUO inférieure à 60 jours. Mix with beer for an even better marinade.